In New Jersey, criminal mischief is considered a property crime. These offenses typically involve damage caused to someone else’s property and/or endangering others as a result of tampering with someone else’s property. Due to the nature of criminal mischief offenses, these charges are often issued in conjunction with charges for trespassing. The degree of charges for criminal mischief are determined by the circumstances of the specific case. The factors that influence the degree of these charges include: the estimated value associated with the property damage, the nature of property that was allegedly damaged (i.e. a research facility, grave, public utility, public transportation, or airport), and whether or not anyone was injured as a result of the offense. Regardless of the degree of your criminal mischief charges, these offenses leave you exposed to significant penalties, including fines, restitution payments, community service, and jail time. Criminal defense attorney William Fay has years of experience representing clients facing criminal charges in Camden County and throughout Southern New Jersey. By leveraging his years’ of experience as a former Deputy Attorney General working for the New Jersey Attorney General’s Office, Mr. Fay works diligently to secure the best possible outcomes for clients. To receive a free consultation about your criminal mischief case today, contact his offices at 609-832-3202. A charge for second degree criminal mischief applies when the offense results in the impairment of a public service and this interruption causes the death of another person. A conviction for second degree criminal mischief may result in a sentence to serve between 5 and 10 years in New Jersey State Prison, as well as a maximum fine of $150,000. These offenses may also entail mandatory restitution payments and community service. A charge for third degree criminal mischief applies when the offense results in property damage estimated at $2,000 or more, or if the offense results in the substantial interruption or impairment of a public utility, communication system, or public transportation; the disruption or damage of property at a research facility; damage or destruction of a grave, crypt, or mausoleum; or the bodily injury of another person. A conviction for third degree criminal mischief may result in a sentence to serve between 3 and 5 years in New Jersey State Prison, as well as a maximum fine of $15,000. These offenses may also entail mandatory restitution payments and community service. A charge for fourth degree criminal mischief applies when the offense results in property damage valued at between $500 and $2,000, or if the offense results in damage to an aviation facility, airport, landing field, air traffic device; gas, oil, or water pipes; or telephone wires. A conviction for third degree criminal mischief may result in a sentence to serve up to 18 months in New Jersey State Prison, as well as a maximum fine of $10,000. These offenses may also entail mandatory restitution payments and community service. Criminal mischief is classified as a disorderly persons offense when the crime results in property damage valued at $500 or less. A conviction for a disorderly persons criminal mischief offense may result in a sentence to serve up to 6 months in the county jail, as well as a fine of up to $1,000. These offenses may also entail mandatory restitution payments and community service. Note: New Jersey punishes criminal mischief offenses involving graffiti with mandatory community service, in addition to the other penalties imposed. 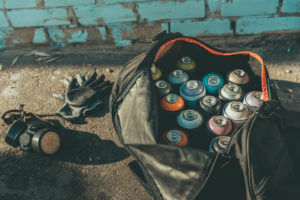 When you are convicted of criminal mischief that involves graffiti, you must perform a minimum of 20 days of community service, during which you are required to remove any of the graffiti that you created. If you or someone you love has been charged with criminal mischief or another property crime in Camden County or elsewhere in South Jersey, it is highly advisable to consult with an attorney as soon as possible. Contact our firm at 609-832-3202 for additional information and a cost-free consultation.